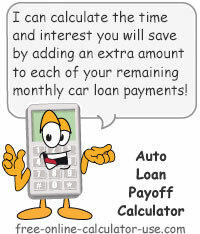 This early car payoff calculator will calculate the time and interest savings that will occur if you increase your monthly car loan payment by a specified amount each month. Plus, the calculated results include the current lump sum payoff amount, the new payoff date, and a car loan amortization schedule with extra payments. Back to the future: a thought provoking analogy. Mindless habits destroying future photographs. Make today be a contributor from your past. Calculate your early car loan payoff savings in both time and interest. Enter the original dollar amount of the car loan, but without the dollar sign (principal amount). Enter the annual percentage rate (APR) of the car loan, but without the percent sign (for .079 or 7.9%, enter 7.9). Enter the current monthly payment amount without the dollar sign. If you leave this field blank the calculator will calculate your monthly payment amount for you. Enter the amount you could add to the regular payment each month (without the dollar sign). This extra amount is often referred to as a prepayment. Unlike your regular payment amount wherein only a portion of the payment is applied to your balance (a portion is removed to pay interest), the entire prepayment amount is applied to your loan balance. Based on your entered terms and the number of payments you have already made, this is your current estimated car loan payoff amount. Based on your entries this is the month and year your car loan will be paid off if you add the extra amount to all future monthly payments. This row shows the monthly payment, number of payments, and interest cost if you just continue making the normal monthly payment. This row shows the monthly payment, number of payments, and interest cost if you increase your monthly payment by the prepayment amount you entered. This row shows how much time and interest you will save if you increase your monthly payment by the prepayment amount you entered. Enter the original car loan amount. 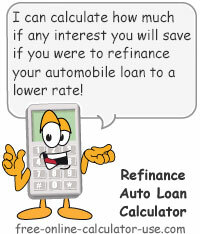 Enter the annual financing percentage rate of the auto loan. Enter the original monthly payment amount. Enter the original repayment term in number of months. Enter the number of monthly car payments you have already made. Enter the extra amount you could add to your current monthly payment amount. 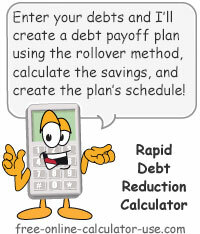 Click the "Calculate Early Payoff" button. This will populate the early-payoff comparison chart, display a bar chart comparing the interest costs with and without the extra payment, and show the revised amortization schedule. If you've ever watched any of the "Back to the Future" movies, you will recall seeing what happens to a photograph when the characters go back in time and change something from the past. One small, seemingly insignificant change in past events can set off a chain reaction that causes characters portrayed in photographs to fade out of focus, and even disappear completely. Whether you realize it or not, you are living in your past right now. In other words, as of tomorrow, today will be a permanent part of your past. Unfortunately, you don't have photographs of you that were taken in the future. If you did you would be able to see what happens to yourself, those you love, and your lifestyle as you make changes to your past (today). You would be able to see how one, seemingly insignificant change today can cause emotions, people, income and things to fade, come into focus, appear and disappear from the photographs of your future. But alas, the only future photographs you have access to are those portrayed in commercial ads -- ads that are developed by expert marketers, and feature professional actors, actresses, models and famous spokespersons. These expertly designed ads attempt to show you that your future will be better if you buy what the ad is selling. But if you had real photographs from your future you would see that more often than not, purchasing what the ads are selling would be causing things you truly want to disappear from your photographs. If you are guilty of any of these mindless daily spending habits, I'm guessing you have never stopped to think about the gigantic negative effect the combination of these actions can have on your financial future. But wait, the mindless spending of money is not the only action that can cause things you truly want to disappear from your future photographs. The mindless spending of time can be even more disastrous ... or as they say in the movies, could cause a crack in the space-time continuum! The mindless time spent watching TV, playing video games, Facebooking, Tweeting, texting, etc., all consumes time that could have been used to take actions that will cause things you truly want to appear in your future photographs. Actions you could be taking include actions such as, increasing your knowledge, increasing your marketable skills, researching necessary expenditures, tracking and planning your spending, spending quality time with your loved ones, and so on. What can I do today that will cause today to stand-out from other days in my past? Now of course I'm not able to make every day stand out, but just keeping this question in front of me helps me to, at the very least, avoid taking actions that will cause things I truly want to disappear from my future photographs, and to look for opportunities to take actions that will cause things I truly want to remain and appear in my future photographs. What does all this have to do with using the auto loan payoff calculator? Well, one of the small, seemingly insignificant actions you can do today to make things you truly want to appear in your future photographs, is to refrain from taking a mindless action (time or money expenditure) and then invest the savings into something that will make a positive contribution to your future. As just one of hundreds of possible examples, if you can force yourself to skip buying that designer cup of coffee, you can then set the savings aside to apply to paying off your car loan early. Then use your imagination to see things you truly want start to come into focus.